There is a fourteen-page booklet, released in 1904, which is the very first Jell-O recipe book. You can read the full pamphlet here; I could see myself spending a week just making molds just from this little book: Moulded Tomatoes, Shredded Wheat Jell-O Apple Sandwich, Chrysanthemum Salad…But today, just one: Philadelphia Ice Cream. I decided to start off the week with something appealing, and refreshing– I want to strike a balance between the horrors of Jell-O, and some ideas that might be innovative and delicious. I didn’t have any one-pound baking powder cans handy (who does?) so I emptied out a cannister of Itallian-style bread crumbs. I trotted out to the grocery store and picked up a gallon of vanilla ice cream; and since it’s one million degrees outside, by the time I got home the ice cream was soft and pliable. I spooned it out and lined the bread crumb can, leaving a channel in the center. I set it upright in the freezer to harden. For the filling, I decided to use peach Jell-O; although it’s not one of the original Jell-O flavors available in 1904 (strawberry, raspberry, orange and lemon) I thought I would add a modern twist. I prepared it according to the package directions, let it thicken in the refrigerator for about 30 minutes, and then folded in one sliced banana. I left out the extra 1/4 cup of sugar the recipe suggests; I didn’t think it necessary. 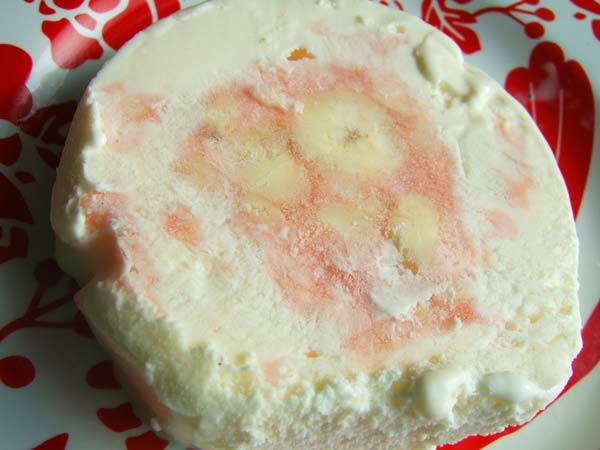 I took my ice cream mold out of the freezer, and poured the nanner/peach mixture down the center. I topped it off with a few more scoops of ice cream, and put it all back in the freezer overnight. The taste was good, but there were logistical problems: The ice cream melted faster than the Jell-O core, so you didn’t get to enjoy them together. The outside came off in warm ice cream creamy goodness, but then the center would still be too hard to eat with a spoon. Would I make this recipe again? Probably not. 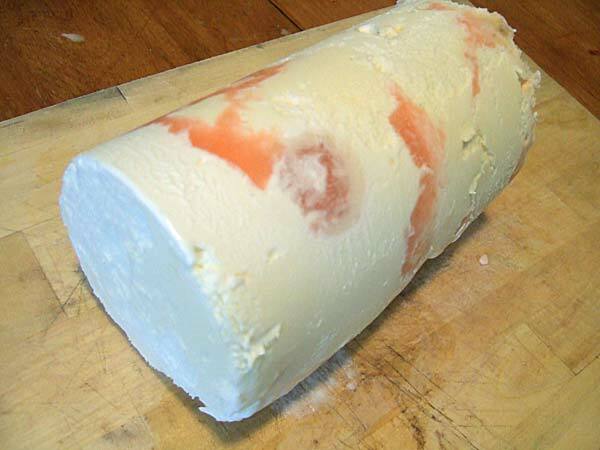 Would I make ice cream tubes and fill it with other things? Probablly. Frozen raspberries. Cake batter. 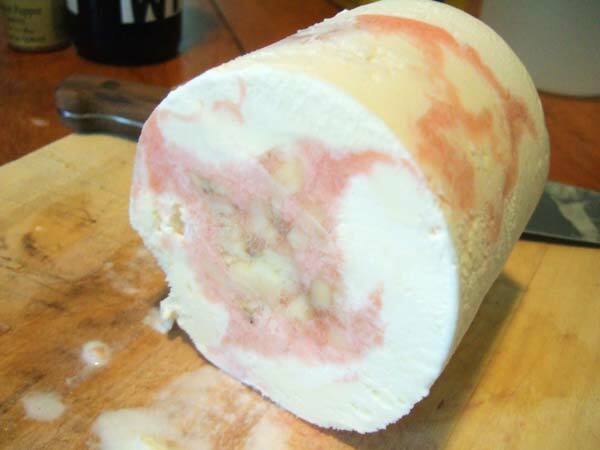 Other ice cream–what about a Neopolitan dessert, made from concentric circles of vanilla, chocolate, and strawberry? What would you put in the center of an ice cream tube?